Is Your Tennessee Business Subject to HIPAA Regulations? According to the official HHS website, HIPAA requirements include those found in Public Law 104-191, a final privacy rule adopted in December 2000, a final Security Rule adopted in February 2003, an Enforcement rule, and an Omnibus Rule.3 An unofficial version of all HIPAA regulations is found in a combined regulation text on the HHS website.4 This unofficial version of regulations is 115 pages long. You may read the full regulations for yourself if you want. However, the purpose of this article is to provide a snapshot into what HIPAA is and the basic requirements it imposes on businesses. Hypothetically, if your business contracts with a health care provider to provide database storage, would this use subject you to HIPAA requirements? Most likely, yes. Providing database storage may be determined to be a business associate, as your role would be to receive or maintain protected health information on behalf of your company’s client. Also, you should be able to determine who your customers are to determine if they are health care providers or other covered entities. What if your company provides generally applicable services, such as email available to the public, yet you do not contract directly with a heath care provider? Then the business owner would not have a contract that authorizes the business to create, receive, maintain, or transmit protected health information. Thus, that company should not be subject to HIPAA regulation. Why Should My Company Pay Attention to HIPAA Compliance? In many areas of the law, it is wiser to plan ahead and spend money on compliance than stick your head in the sand and risk an extreme penalty if you are caught. 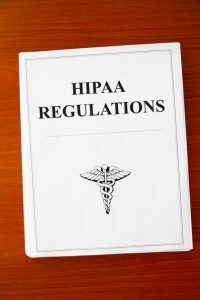 If you are unsure whether your business may have HIPAA compliance issues, you should read more on the subject and consider consulting with an attorney or hiring your own HIPAA compliance expert.